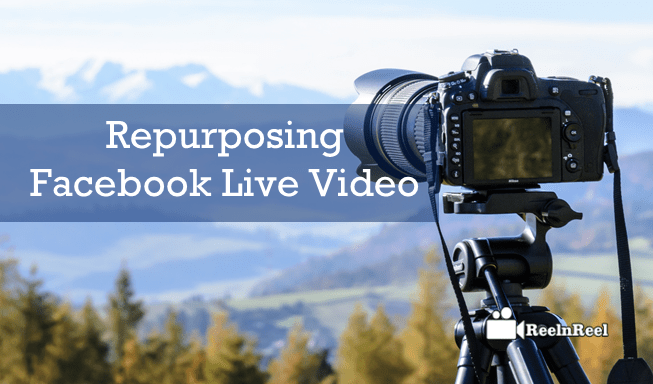 Home » Video Marketing » How To Repurpose Your Facebook Live Video? How To Repurpose Your Facebook Live Video? Do you want to feed your followers with your Facebook live videos by re-uploading? Is it becoming smudge to create the ultimate video content for your social media fans? Just go ahead of following the below phrases to implement at your audience which grabs their attention. Live video is the life of brands or public figures to engage the audience directly on social media platforms either for business or personal purpose. Most of the brands are in the use of streaming live events, especially on the giant social media hub Facebook before landing in the market. Simply Facebook live video is the excellent influencer to attract the attention of the audience. Moreover, it is the ambassador to introduce a brand or person to the millions of social media users. The most significant one is that the audience or customers can directly interact with the presenter to clarify the doubts through comments or calls in live. Hence, the live video is the real evidence to prove something or someone else with no manipulations that every viewer will believe. Well that the broadcasting of Facebook live video is gaining more followers or fans than other approaches. Here are the step by step tasks to repurpose your Facebook live videos. Just go through your Facebook page and click on the tab of Videos. Then choose the video to repurpose. Now click on three dots appears at the bottom right corner of the video plays. Then hit on “Download Video” after that video starts downloading automatically. If you broadcast your live video from your Facebook profile download the video by following the below steps. Click on the video tab of your Facebook that is visible at the Cover photo. Now the videos list will be displayed. Then pick the “Save Video As” to save the video as the MP4 file format. Adding the Facebook live video to the YouTube is the most effective tool to grab the potential customers from the giant video hub along with Facebook. The important thing to remember is to make your video with keywords and description to make it visible in search results. Also, make sure to allow the access to embed the video for all other channels. Facebook live videos are much preferable than any other videos on social media as they deliver the fresh content to the audience that is existing. Collaborating with the other creators on both Facebook and YouTube helps to pull their followers and subscribers by uploading your live videos at their profiles. It is the simple way to get the attention of the global audience to catch up on your creation. After downloading the video separate the audio from video as some likes to listen the audio without video. You can use the iMovie to separate the audio. Save that audio as the Podcast. It is another way to clutch the other side of audiences. Push the links of your Facebook live video to the newsletter subscribers as most of the emails will not support embed videos. Let your scrisbers find the upcoming live streaming events through your old live videos. To do this just click on Post option appears at the post detail. All this is to edit, embed and schedule the post date for the video you upload on website or blog. Now right click on the image of the video to choose the options that you need. Then select the “Embed” and copy the code to post on your website. Why do you need to do all this? Because most of the visitors of a website like to click the video content as it is most effective than reading. Just add the content to the live videos to notify your fans about the coming live events. It helps to circulate your upcoming events with your old dough. Split your Facebook live video to share on other trending social media platforms like Instagram, Twitter, and Snapchat, etc. where it goes viral in a short span of time. Make use of the useful tools to repurpose the Facebook live videos that work. Most of the creators are on the path to get the unique creative ideas to engage the fans on the social media. But there are fewer chances to find the better to reach the audience expectations. In such cases repurposing the live videos that are viral in the specific platform helps to add the fans.